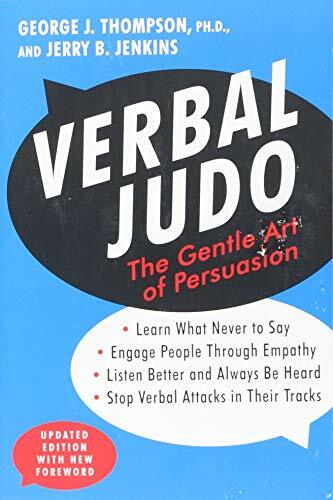 Verbal Judo offers a creative look at conflict that will help you defuse confrontations and generate cooperation from your spouse, your boss, and even your teenager. As the author says, "when you react, the event controls you. When you respond, youâre in control." This new edition features a fresh new cover and a foreword demonstrating the legacy of Verbal Judo founder and author George Thompson, as well as a never-before-published final chapter presenting Thompsonâs "Five Universal Truths" of human interaction. About: Verbal Judo is the martial art of the mind and mouth that can show you how to be better prepared in every verbal encounter.